The above are properly called Coats of Arms. Confusion over the term family crest probably arose from an understandable abbreviation of the terminology in heraldry for an important part of a coat of arms. It is not difficult to see how the use of the term crest could have become synonymous in common use with the term coat of arms, since one is a part of the other. The coat of arms consists of several parts — the shield, the mantling, the helm, the wreath, charges, and the crest (not all arms have crests). Coats of arms are not awarded to a family or a name, but to an individual. 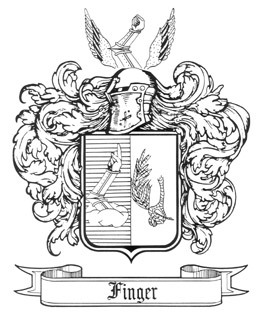 This is why there is no coat of arms or family crest for the family name Finger -- only a coat of arms and crest granted to someone with that name many years ago. 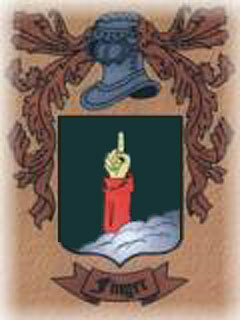 Often you will find more than one coat of arms associated with a given surname. Coats of arms usually started out fairly simple in design, then subsequent generations added onto or made slight variations to the design to make it their own. 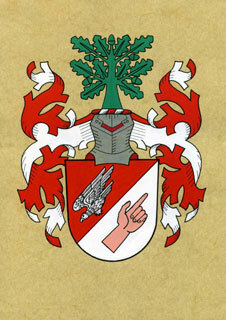 Marriages often resulted in a combination of two different family lines' coats of arms.